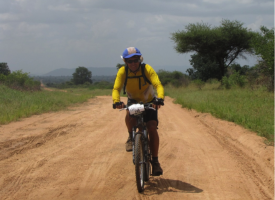 This is the fourth post in our series profiling some of our Super Alumni, riders who have cycled many expeditions and kilometres with us over the past years. Check out the previous posts on Svend Paulsen & Chris Wille & Brett Lanham. I am retired from the General Motors Transmission Plant in my home town of Windsor Ontario. My career there was cut short by a severe motorcycle accident that resulted in breaking dang near every bone in my body. After 6 months in traction, rehab began and, eventually, it was suggested that cycling could be good for me. I bought a bicycle from a shop in the neighbourhood and began to ride around the block. Each time out I improved and increased my distance to visiting friends in the neighbourhood. With time I found myself going further and further. After a few years, a friend showed the travel section of the Detroit Free Press in which there was a story about the Palm Pedal across lower Michigan. It was a weeklong family oriented ride with low mileage that goes from Lake Michigan to Lake Erie. I was intrigued and signed on the following year. It was well organized and I had a lot of fun, so much so that I decided I could do this forever. I have never looked back. The Palm ride will be forever known as my “sweetheart cycling tour” because it was there I got bit bad by the touring bug. And that’s basically how I came into having such a burning desire to see the world via a bicycle. What prompted you to decide to start doing long distance cycle touring? Were you apprehensive before you started ? Without a doubt my favourite cycling tour is the Tour d’Afrique. Africa is a special continent with so many diverse countries and people that it truly was a pleasure to discover. Whenever I am asked about this tour all my answers evolve into more questions and amazing and long winded tales. In Africa I had unbelievable luck, both good and bad. I saw the Pyramids, swam in the Nile, and floated down the Zambezi. I saw more beautiful birds than I can count, and flowering trees that I’d never seen before. The local people are genuinely interested in you and where you lived. One of my fondest days on the TDA was the uphill stage into Gondar. 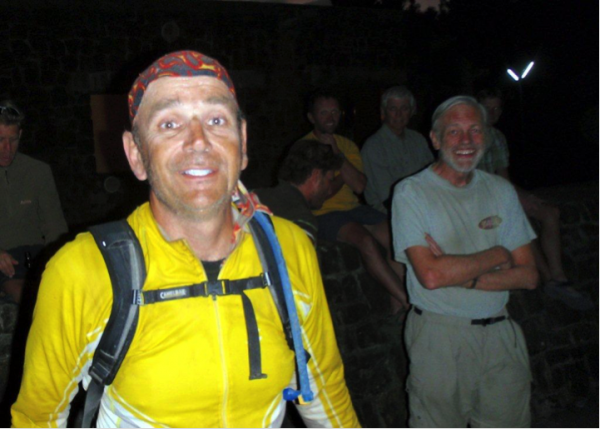 I had been in the saddle almost 12 hours when I reached the top of the final climb and received a “hero’s welcome.” Miles had given me the coldest drink I ever had about 4 kms from the finish and I was cheered on by Brian as I ascended the last switch back. Fellow riders helped me set up tent and guided me to the showers. A few days later my frame cracked but I soldiered on to Addis where I purchased another bike from a departing sectional rider. For the last half of the tour I had worms crawling around in my back. It took four bicycles for me to get to the finish line in Cape Town and yet I still finished the tour as an official “EFI” rider! 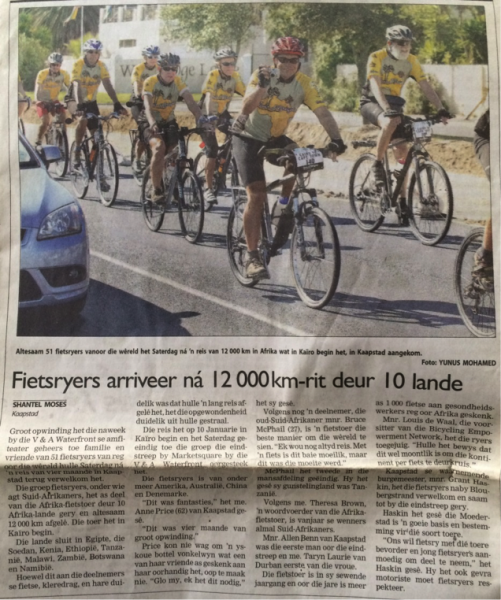 And I ended up on the front page of the Afrikaans “Die Burger” newspaper to boot! Mind you I also have the dubious honour of being the slowest cyclist ever to achieve EFI. What an honour… even the Paris-Brest-Paris cycling event has their “Lantern Rouge!” Memories of a lifetime ! The single greatest moment of my cycling career was no doubt the day I completed my quest of riding around the world in a linear fashion. 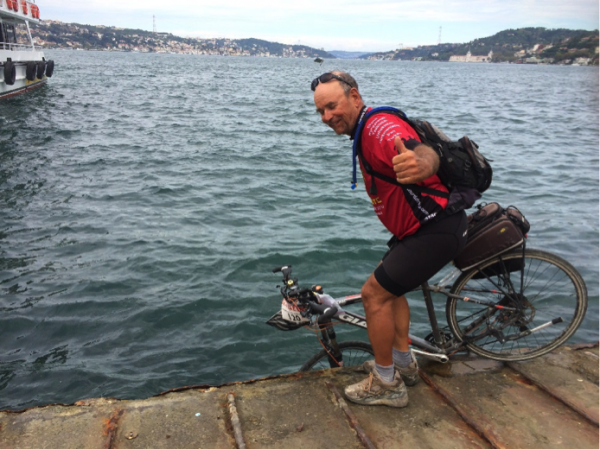 On the last day of Silk Route I dipped my tire in the Bosphorus Strait on the Asia side of Istanbul; almost right across from where I had celebrated in similar fashion on the European side at the end of the Orient Express. I have made a practice to dip my tire in a major body of water on all my epic adventures, even if it meant arriving early to make it happen and cycling my way back to a start line. Do you have any pro tips for new cycle tourists? Life lessons from cycling… most goals in life are achieved the same way as cycling the toughest climb or in the nastiest weather… one pedal stroke at a time with gentle pressure relentlessly applied! What else do I do when I’m not on a bicycle ? I am a quilter. I like to make quilts and enter them at the Harrow Fair. Now it costs $7.00 to enter and first place is worth $6.00! … BUT the competition is very stiff. While I will never get rich doing this, the memories of making and giving away these quilts are priceless … just like my adventures … and I will have lots to talk about when I ripen to 100 and become a centurion. In the meantime I plan on crossing my 5th continent … TDA’s South American Epic in 2017, and if we should meet it is bound to be fun. While I do have a bad Coca Cola habit, cold or warmish it doesn’t matter, it’s a guarantee that I will hold up my end of the conversation! Hope to see you there! 8 comments for "TDA Super Alumni Profile: Lloyd Strong"
You are a legend indeed in my books and an inspiration. It’s a pleasure to know you and to hear of your exploits. Always fascinating. I can’t wait to hear tales from your next tour. Its not only an education but a pleasure riding with you. Thanks Ralph, it’s always a pleasure to ride with you as well! It is an honour to know and ride with you Lloyd. Your stories are wonderful and your roadside repair skills are the best. We love to hear your stories Lloyd, thanks for sharing! I miss hearing all of your cycling tales and seeing the new quilting projects you are working on. Thank you for both! They were both inspiring! It was great reading your stories. 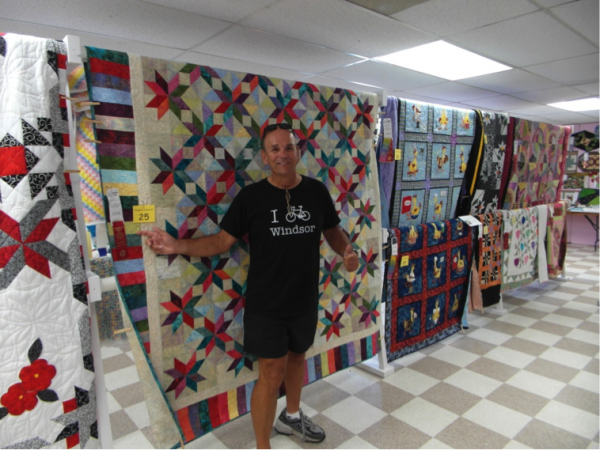 What do long distance biking and quilting have in common? Only Lloyd Strong. Adventure in South America here we come ! Bravo ! 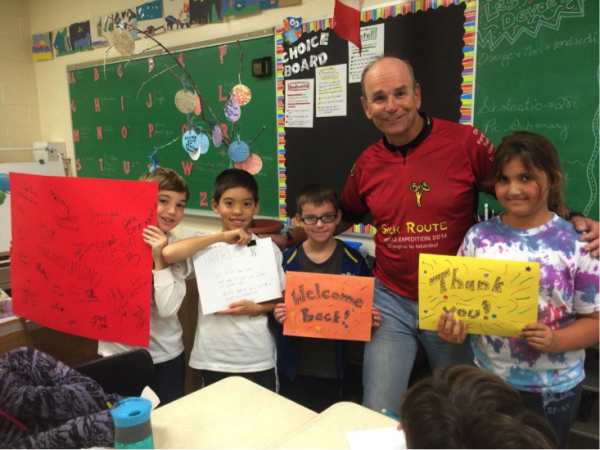 Leave a comment for "TDA Super Alumni Profile: Lloyd Strong" by visiting the original post on our TDA Global Cycling blog.